Most people get enough probiotics, or at least know that they ought to do it, but what they do not know is that their body needs prebiotics in food, which is consumed daily. It is an indigestible dietary fibre, which triggers the growth of bacteria and has a positive effect on the entire intestinal flora. Not to be confused with probiotics - good bacteria, without which our bodies would not be able to function normally. Simply put - prebiotics are food for bifidobacteria and lactobacilli, that drive the metabolic processes in the body and successfully suppress pathogenic microorganisms. What is inulin and why do we need it? 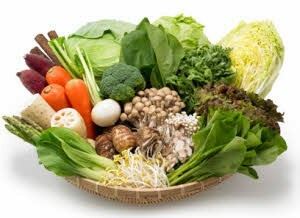 The best-known prebiotic is inulin, which is found in garlic, onions, leeks, asparagus and artichokes. However, because of their importance on health, they are often added to some finished products, such as cereals, biscuits, bread, spreads, drinks and yogurt. It is known that prebiotics in food improves intestinal flora, preventing the development of cancer, strengthen the immune system and encourage faster weight loss. Also, alleviating the symptoms of ulcerative colitis, Crohn's disease, irritable bowels and unfavourable celiac disease. Prebiotics are not digested nor absorbed in the intestines, the most popular types are inulin, oligosaccharides and arabinogalactans. Some of the foods that contain prebiotics are: onions, garlic, leeks, radishes, carrots, coconut and coconut flour, flaxseed and chia seeds, tomatoes, bananas, chicory, dandelion, artichoke, asparagus and sweet potatoes. If on the daily menu you have these foods often, you will do a lot for your digestion and the health of your entire digestive system. Inulin and oligosaccharides are short-chain polysaccharides that is chains of carbohydrates that act in different parts of the colon, thus contributing to health. A rise in population and the maintenance of good bacteria - suppresses the pathogens that cause different and not at all pleasant health problems. One of the most important benefits that are attributed to prebiotics is that they strengthen the immune system. Babies benefit from them while they are still in the womb, and is also considered to reduce the risk of eczema, accelerates growth of metabolism, and increase tolerance to milk and milk products. Because of this it is added to the finished products, especially for feeding the youngest. Extensive research has shown that prebiotics in foods encourage the creation of T-cells, which are important for the immune system. In fact, feeding the good bacteria they strengthen the immune system of the digestive system, but also of the whole body. Pathogens are easier to permeate in the intestine, and then colonize other organs in the body. Therefore, it is essential to rehabilitate bowel inflammation and provide enough food for the development of beneficial bacteria. Studies have shown that prebiotics in food successfully alleviate symptoms of inflammation of the colon. Among other things, this condition includes the absence of an immune response to the bacterial culture in the intestine. This is true for patients with Crohn's disease, celiac disease and ulcerative colitis, which have reduced the number of good bacteria in the digestive tract, and this is usually the result of taking antibiotics. It was shown that prebiotics in food significantly alleviate symptoms of ulcerative colitis such as stomach pain, diarrhoea and bloody stools. In addition, it increases the absorption of nutrients such as calcium, and stimulate bowel movements. Wanting to combine two good products and offer them to customers together in a package, pharmaceutical companies have created a so-called symbiotic - a mixture of probiotics and prebiotics with a wide range of beneficial effects. This easily digestible food will improve the microflora of the digestive organs and prevent the spread of pathogenic bacteria. Symbiotic strengthen the immune system, lower the level of bad cholesterol in the blood, prevent colon cancer, renew the lining of the intestines after antibiotic therapy and help in the treatment of urogenital infections. Some research even suggests that prebiotics in foods have a similar role as antioxidants, because they neutralize carcinogens. In fact, they feed bacteria that produce key short chain fatty acids (butyrate, acetate, propionic acid and valerate), which strengthen the intestinal lining. The production of short chain fatty acids prevents cancer, because thereby they reduce the pH in the intestine. The two most famous good bacteria in the human body are bifidobacteria and lactobacilli, and both produce lactic acid, which protects the colon reducing the pH value. Lower pH in the colon means a lower risk of cancer because it inhibits pro cancerogens enzymes. The bacteria also produces butyrate, which is associated with apoptosis (suicide) of cancer cells, as well as increasing antioxidant glutathione in the gut. The researchers also found that if the prebiotics in foods are taken regularly, they can reduce appetite and the risk of type 2 diabetes, since they contribute to the maintenance of blood glucose levels. One study analysed the effects of prebiotics and probiotics in more than 6,500 people. Individuals who drank yogurt not only reduced insulin resistance and blood sugar but already had a significantly lower triglyceride levels and blood pressure. Although more evidence about this is needed, researchers believe that increasing butyrate inhibits the production of cholesterol in the liver. Heat the olive oil over medium heat, then add leeks and onions. Add salt and simmer for five minutes, then add the garlic and sauté for another minute. Add potatoes and vegetable broth, cover, lower the temperature and cook for 20 minutes. Allow it to cool a little, mix the leaves of rosemary. Pour again into a saucepan, heat to boiling remove from the stove. Serve warm. Combine all ingredients for the dressing and set them aside. Cook the beets until tender, then drain. Allow it to cool, peel and cut into cubes. Cook leeks in salted water for about ten minutes, and then strain it and rinse under cold water, cut into pieces and pour into a salad bowl along with beets. Pour the dressing, gently mix and sprinkle with chopped parsley. Prebiotics in food are extremely important for the entire immune system, so we have put together another great recipe. Wash the vegetables, then clean and chop finely. Tear the lettuce leaves and place them in the salad. Add the leaves of young spinach and other vegetables. Season with salt and pepper, add two tablespoons of olive oil and lemon juice, and stir well. In particular, mix sour cream with lemon juice and olive oil, season with salt and pepper and add the chopped parsley. Pour over the salad and sprinkle with the grated Parmesan cheese. We hope you found out how much prebiotics are important for overall health and that you liked our recipes.